Game distributors PHD and Coqui Hobby Distribution are looking to get some people some motivation to paint up some minis. They think that giving away some prizes for The Army Painter would be a good idea. I certainly agree. 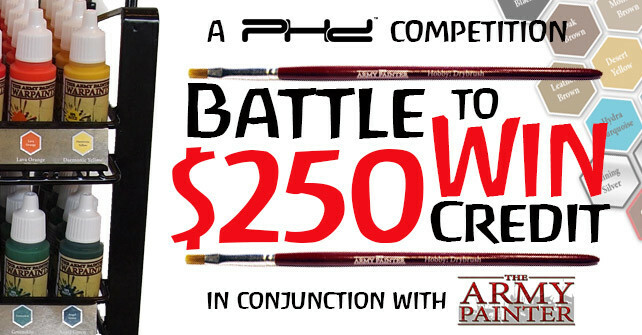 As such, they're running a painting competition where hobby stores can win a prize as well. Stores can sign up to be part of the event. Then the shops will hold their painting competitions within their store with the winner getting $50 The Army Painter vouchers. Then, photos of those winners will be uploaded and voted on by all the shops as well as The Army Painter. The winning shop will get $250 store prize. Sign-ups last until the end of September, with the store judging to happen on or before October 31st.